By Stephanie Moulton Sarkis Ph.D.
Making it through college is a challenge – making your own schedule, getting good grades, staying organized can be stressful. It’s even more so for people with attention deficit disorder, or ADD. Keeping track of schedules and deadlines, concentrating on lessons, and completing tasks are all hard-learned skills for people with this condition. Because of these difficulties, students with ADD are more likely to drop out of school or spend extra, costly years pursuing their degrees. This book offers young adults with ADD a comprehensive guide to getting the most out of college life. The simple, easy-to-follow chapters in Making the Grade with ADD will help you handle common academic issues such as setting schedules, studying, and mastering note- and test-taking. Social issues like establishing a living situation, organizing a dorm room or apartment, and making time for socializing are covered. You’ll get tips for developing a healthy lifestyle, participating in extra-curricular activities, planning for the years after college, and more! This book provides great information for any freshman looking for knowledge and strategies to succeed with AD/HD in college. 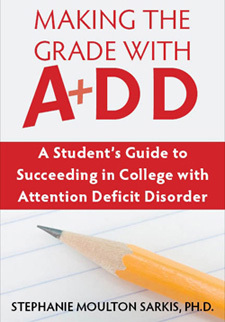 Even if you just want general info about AD/HD as it pertains to a college student this book would be a good resource for you.The author (who has AD/HD) gives you valuable warnings, solutions, common misconceptions and just generally good advice about challenges you are likely to face in college because of your diagnosis and ways to overcome them. This includes obvious things like grades, studying, finding a major etc. but also includes other important things that most people don’t really think that their AD/HD might affect such as roommate relationships, romantic relationships, selling your medicine and more. This book is interesting so to keep those who would usually get distracted easily (like me!) engaged. You can also flip to any section in the book you find particularly important or interesting without having to read the book cover to cover to find useful info.I haven’t read any other AD/HD college survival guides, but I haven’t needed to! Overall great job! I am a pediatric occupational therapist as well as a mom of 2 boys with ADHD. I bought this book for my son who is a senior, however, I have used it for my clients as well, even younger ones. It has great resource information in a very easy to read format regarding medication, college choice and application process, things to look out for that are common pitfalls, etc. Provides sources to back up information. One suggestion. Buy this book between your child’s sophomore and junior year in highschool. The parent should read it first, then give it to their child. Good info for both parties. Lots of food for thought. I loved this book, and it holds a lot of really good resources. The only thing I didn’t like is that I wish there was more. I know the author made a point to make the book short so that someone with ADD/ADHD can have an easy time tackling it, but I can handle more info. The author also goes around and gives lectures and conventions, and I’m half-thinking about going to one. She has a lot of schooling and experience specifically in the ADD realm, rather than just psychology, in general.